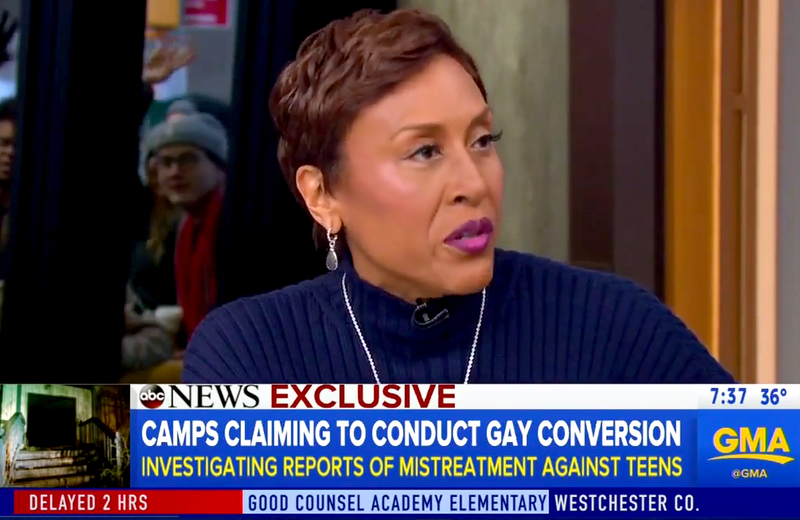 Robin Roberts became emotional during a Good Morning America segment about underground gay conversion camps on Friday, March 10. The gay news anchor, 56, thanked her late parents, who were deeply religious, for being supportive when she first came out. Watch the video above. In the short segment, GMA went undercover to expose the conversion camps, which are outlawed in most states. As previously reported, Roberts came out to the public in December 2013. She disclosed her relationship with longtime girlfriend Amber Laign in a Facebook post in which she reflected on battling myelodysplastic syndrome and a successful bone marrow transplant. Laign and Roberts have been together for more than a decade.